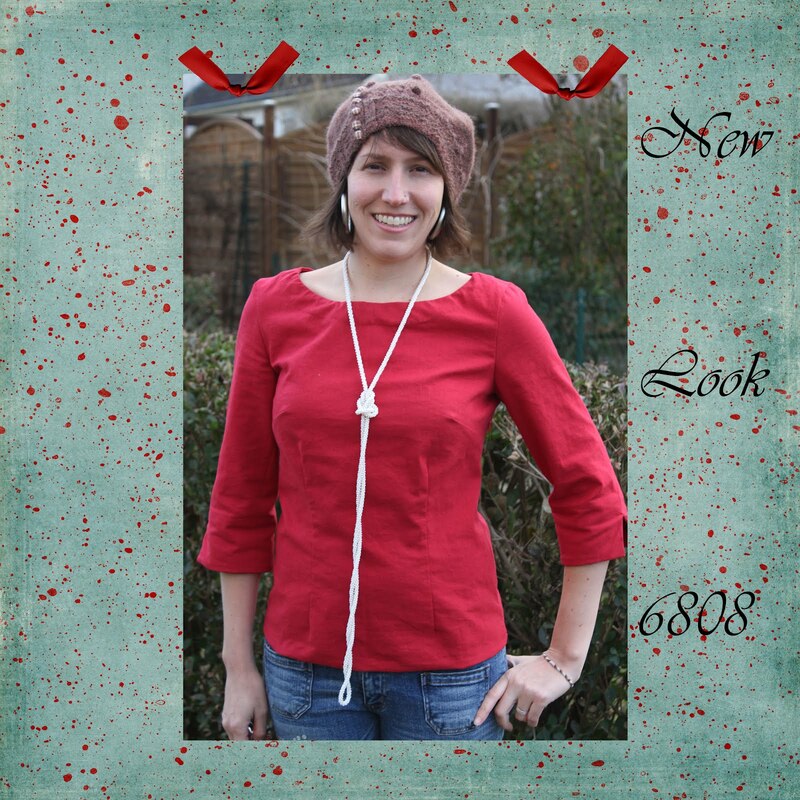 The most recently completed project - New Look 6808 - is a double whammy because it was on my Fall Essentials Palette and on my Closing the Gap list (a red shirt). I really love the result and I'm sure I'll be using this pattern again. I'd like to redraw the neckline and do a scoop neck eventually. I will make other changes for the next go-round. I had to chop off 5.5 cm from the hem because it was too tight across the hips, but I really liked the longer length. I should've graded out to a size 12 below the waist. And next time I'll make the bust darts shorter because the length now makes me look *ahem* pointy. AND, this time around I took out some of the width on the back darts to help with my sway back, but I didn't take out enough because I still have some pooling. So, next time around I'll make the back darts even skinnier...although grading out to a size 12 at the hips might help with that. Finally, next time (and I should really just use this technique all the time) I'll insert the sleeves flat and sew up the side seams afterward. 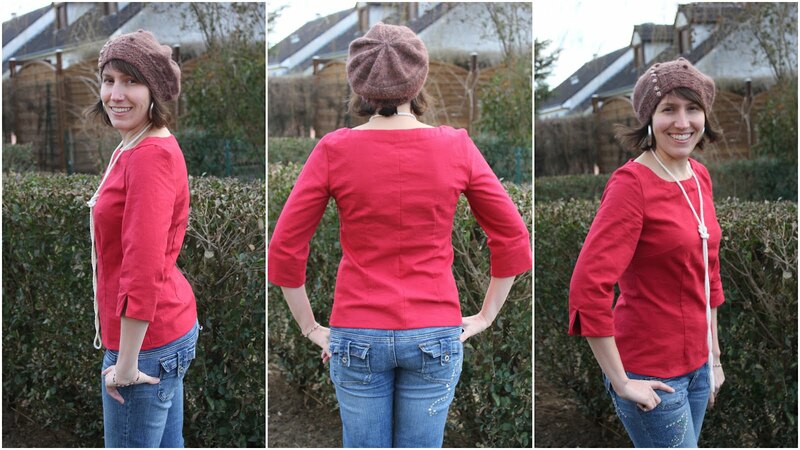 I managed to ease in the sleeve caps, but the top is still lumpier than I'd like. I'm hoping I can tame things a bit with an iron. Still, I'm quite pleased and I can see myself making a lot of different versions of this pattern. I happened to have to leftover red ribbon (from making Christmas ornaments last year) and I'm happy with the effect. I was totally inspired by Kat's blue skirt at Modern Vintage Cupcakes. 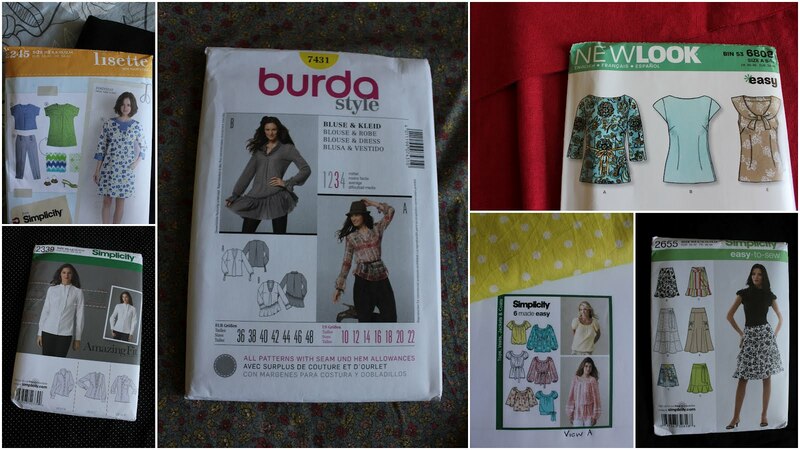 I need to buy some hem binding tout de suite! I guess if I had finished this last week it could've been a Valentine's Day shirt! I totally did not plan that. Ok this is too cute! I made a disastrous version. Of this with a prissy collar, now yours has me wanting to break it back out and make friends. Love it! I like this a lot! I have made similar tops but mine are much more tent like! Yours is a great balance between not too fitted, not too tent-y. Love the colour too. Knitted hat is looking great too. You look fantastic! 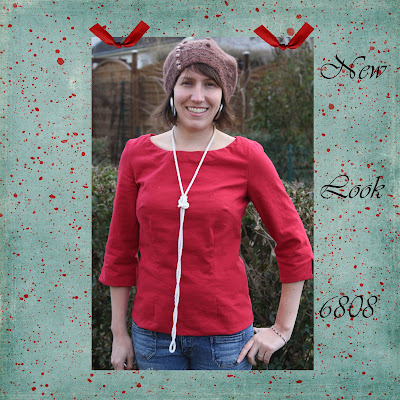 I love the top, and I'm also a big fan of how you styled it with the necklace and hat - tres chic! Thanks everyone! 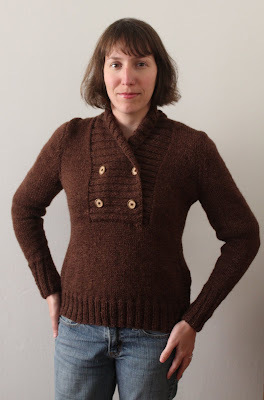 I like the other collars but I'm not sure I can pull them off, so I'm thinking of trying to redraw the neckline for my next version. I love it! The fit looks good and the colour is so pretty. 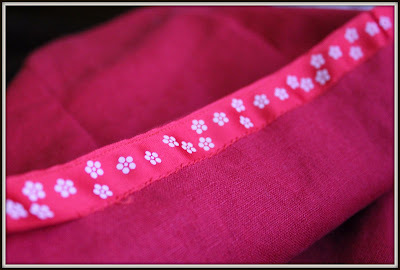 And I'm very impressed by the handstitched hem - it looks both cute and so neatly done.